Mr. John “B” Clopton Sr., age 87, of Nashville, TN passed away on August 18, 2018 at the VA Hospital in Murfreesboro, TN. He was born in Nashville on December 11, 1930 to the late Roy Clopton Sr. and Nettie Meghar Clopton. Along with his parents, John is preceded in death by his siblings, Roy Jr., Gene, and Ann. John is survived by his companion and best friend, of over 32 years, Marie Parks. He is also survived by his children, Vickie Diane Clopton Hampton (Jim), Johnny B Clopton Jr.(Angela), Karen Finlin(Jeff), and Kat Hitchcock; 11 grandchildren; and 8 great-grandchildren. 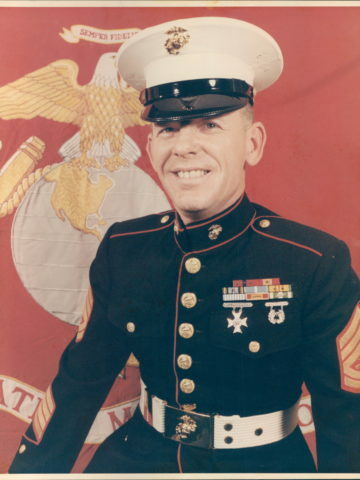 John courageously served his country for 30 years in the United States Marine Corps. During his service he served in Vietnam and Korea, and then was stationed in Okinawa, Japan. He was more than proud of his military history, which could be seen by how he liked to inform others, either through writing or talking about his service. John was also a member of VFW post 1970, where he served as commander for 1 year. Early in life, John was involved in real estate. His hobbies were golf and grilling. John’s family will always remember the times where he pulled through with his handy-man skills, and good sense of humor. A Celebration of Life service will be held on Friday, August 24, 2018 in the chapel of West Harpeth Funeral Home at 12:30pm. Visitation will be held on Thursday, August 23, 2018 from 4:00pm until 7:00pm and again on Friday from 10:30am until the time of service at 12:30pm, all at the funeral home. John will be buried at Middle Tennessee State Veterans Cemetery in Nashville, following full military honors. In lieu of flowers, the family requests donations be made to VFW post 1970, call the post at (615) 352-9933. 2 Comments to John "B" Clopton Sr. Thank you for loving my mama with all of your heart and being a wonderful granddad to Ree’s girls’ children. We will always remember summer long days at the pool. Rest well, soldier. You’ve earned it.